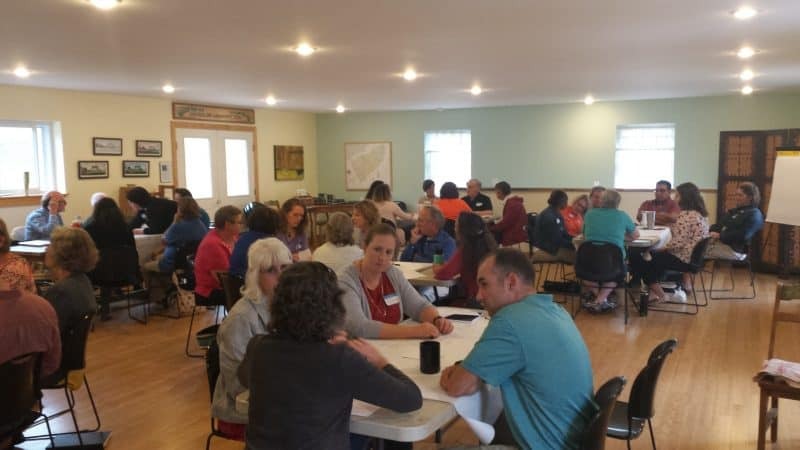 Christiansburg, Virginia; April 2, 2019: The Community Foundation of the New River Valley (CFNRV) is pleased to announce the recipients of the 2019 Emergency Food Program Infrastructure Grants. Plenty!, Radford Fairlawn Daily Bread, Giles County Christian Service Mission, and Warm Hearth Foundation were each awarded grants in this cycle. The program, which is supported by CFNRV’s Thrive initiative, provides one-time funding of up to $4,000 to organizations working to collaboratively expand capacity and infrastructure for food access across the region. In this cycle, each of the four grantees sought support to improve food storage capacity to create sustainable infrastructure and expand the scale of support they are able to provide to those in need. Plenty!, for example, saw a 60% increase in patrons after the closure of another pantry in November, 2018. As part of this change, Plenty! gained access to that organization’s meat and deli donation pickups overnight. This provided Plenty! with new sources of protein for the food pantry, but presented a serious infrastructure challenge, requiring Plenty! to store an additional 250 pounds of food per day. Their infrastructure grant will help them transport, store, and easily display this extra food at the pantry, increasing capacity and helping them meet the surge in demand. Kerry Ackerson, Executive Director of Plenty!, said, “We don’t lack the distribution opportunity, we lack storage. The net of this grant is 139 more square feet of cold storage, which is a targeted update to help us address this phenomenon”. Giles County Christian Service Mission will also use their grant to improve cold storage, more than doubling their freezer capacity and enabling the Mission to significantly expand the amount of nutritious food they can safely store and distribute. The grant program also encouraged multi-organization collaborations. Warm Hearth Foundation’s collaborative grant supports Micah’s Meals, which is a partnership between Warm Hearth, Sodexo, and the Virginia Tech Campus Kitchen (VTCK) to reduce food insecurity and food waste by distributing 75 free meals per month to low-income seniors on the campus of Warm Hearth Village. Their grant will support the purchase of cold food storage, bulk cooking equipment, and delivery materials with the aim of quadrupling the number of meals distributed per month while nearly eliminating container waste. Karen Nelson, Associate Director of Development at Warm Hearth Foundation, believes the Thrive Food Network has led to more collaboration for their organization. Nelson said, “We have made connections with other organizations in the community through this program”.